President Donald Trump met with a group of about 20 black pastors and Christian leaders at the White House on Wednesday, a meeting that has upset at least one left-leaning African-American pastor. The roundtable event, dubbed the president's "Meeting With Inner City Pastors," was attended by a number of well-known African-American church leaders who prayed with the president and discussed a number of topics, including urban workforce development, prison reform and possible public-private partnerships with the faith community. 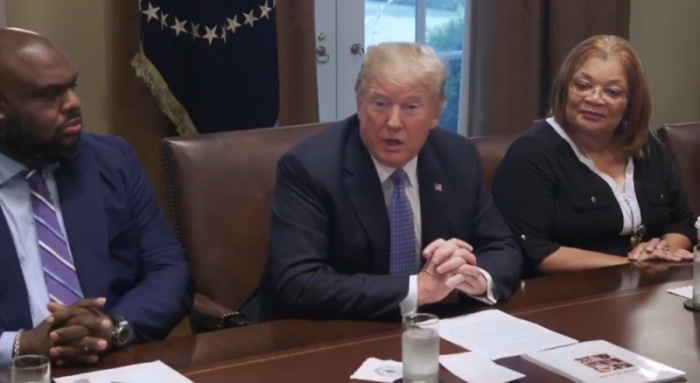 Included in the meeting and seated to the right of the president during the discussion was megachurch pastor John Gray, who previously served at Joel Osteen's Lakewood Church in Houston, Texas before taking the helm at the 21,000-member multi-campus Redemption Church in Greenville, South Carolina. Bishop Harry Jackson of Hope Christian Church in Beltsville, Maryland, who has been actively involved in previous meetings with the administration, was also present. Martin Luther King Jr.'s niece Alveda King, prominent Trump supporter and Ohio pastor Darrell Scott, and Alabama Pastor Kyle Searcy of the multi-racial Fresh Anointing House of Worship in Montgomery, were among the many others who attended. As well, caucasian televangelist Paula White of New Destiny Christian Center in Apopka, Florida, who has played an instrumental role in organizing the evangelical engagement with the Trump administration, also attended the meeting. The full list of participants can be found here. "These are great people, most of whom I know," Trump said at the beginning of the discussion. "And my administration is open, 100 percent, and we have been." After talking briefly about his administration's accomplishments on things like manufacturing jobs and prison reform, Trump asked Gray to pray for the group. "God, we thank you for an opportunity to speak about the hearts of those who sometimes cannot fight for themselves. Thank you for this moment to be able to share our hearts with the president and his administration," Gray said. "Dr. King said we cannot influence a table that we are not seated at. And so we pray that this conversation will be fruitful, and productive, and honoring of the best traditions of this nation." "We further pray that you will continue to give wisdom and insight to our president and his leadership team to be what our nation needs, to build this country from the inside out, that we will continue to be a beacon of hope and light around this world," Gray added. "Bless his family, bless his health, and everything that he puts his hands to do. This is our prayer. And bless our time together." Jackson told The Christian Post Thursday that the discussion was positive and a continuation of talks he has had with the White House since the beginning of Trump's presidency on "urban issues and criminal justice reform." "I am excited that there has been movement and a decision to make some of these issues central to their campaign," Jackson said. Jackson, a conservative, laid out a number of key takeaways from the meeting. He said Trump stated the fact that "unemployment in the black community is at an all-time record low." Jackson said that Trump also explained how his administration has fought hard to include "Opportunity Zones" in the new tax bill to incentivize much needed investments into distressed urban communities. "[This is a] concept that should bring things to another level in terms of bringing resources," Jackson said. Jackson added that Trump told the pastors that he has received commitments to bring about 4 million jobs to urban areas. Trump also touched on the administration's priority to help inmates be prepared to re-enter society, an initiative being led by Trump's son-in-law and senior adviser Jared Kushner. Pastor Jon Ponders from Las Vegas praised the president for the work being done on prison reform. The White House has supported a bipartisan prison reform bill that was passed in the House but has stalled in the Senate. "There are a lot of employers out there right now that are willing to hire people who are coming home from the prison system," Ponders said. "One of the things that we've learned was that employers are not not willing to hire people; they're not willing to hire projects. And because of ... the initiatives, when we're able to help them to be tremendous assets to the employers, and not liabilities, then they're hiring them all day long." "So we just thank you for the direction that the country is going in, and specifically as our partnerships with law enforcement are beginning to grow," Ponders added. King, a known pro-life activist, sat to the left of the president and praised him not just for the pro-life measures his administration has taken but also for "opening up the steel mills." "And I lived across the street, Pastor, in front of a steel mill in Birmingham," King said. "Now, that's when they were bombing us and everything. But the people were at work, so they could go church, they could give." "The dumping is stopping and the steel mills are opening," she continued. Scott, the CEO of the National Diversity Council for Trump, declared during the meeting that Trump will probably be "the most pro-black president that we've had in our lifetime." "This president actually wants to prove something to our community, our faith-based community and our ethnic community," Scott of the New Spirit Revival Center in Cleveland Heights, Ohio, said. The meeting comes as Trump has participated in a number of gatherings with evangelical leaders at the White House. Although Jackson and latino leader Samuel Rodriguez have been a part of many of those meetings, this meeting was different in the fact that it was mostly leaders of color. "I think that is one of the positive major takeaways, that people of color will have access and he feels safe with the faith community because our agenda supersedes politics," Jackson said. "I feel like he feels like he can partner with us to get action done, to take positive steps. In the meeting, he listened, we responded." Jackson said that some leaders made invitations for Trump to visit black churches. "There was a willingness and request of him to have some kind of ongoing dialogue with African-American leadership," Jackson said. "People who say he is a racist, none of them have ever sat down with the guy. [There was a] request and openness of people who have something they could lose from a PR perspective but they said, 'If you are really willing to talk and listen like we talked today, can we do this again? Can we do more of this and talk to you about ways that we could tweek some of the programs you are working on to make them even better?'" In the long run, Jackson said that he thinks this group of black pastors and their friends are "going to get access for more frequent dialogue with the White House." "That is something I have been praying for," he said. The African-American leaders have been criticized for their decision to meet with Trump. Prominent African-American pastor Jamal Bryant posted a video to his social media page claiming that the meeting was merely a "photo op." "[He] doesn't not know that I have been working on this with this group for a long time, nearly a year and a half," Jackson respond. "This is not taking a picture. This is something that milestones are being talked about." On Instagram Thursday, Gray responded to critics. He explained that he didn't participate in the meeting to show support for the president. "My wife @grayceeme told me 'If you go, no one will hear what you say. They won't understand why you're there. And any good that could come out of it will get lost in translation.' Wise words from a loving, discerning wife. I had not one thing to gain by being there. Not. One," Gray said. "But I asked the Lord when I was asked to be present in this initial meeting about potential prison reform-that could greatly end up benefiting many people who look just like me." "I myself have been vocal about my personal disagreements with key policy decisions of this administration. I have everything to lose. Credibility. Reputation. Every natural inclination says stay home. Don't get played. It's gonna be a photo op with no substance," Gray added. "But I did the one thing I can't shake: I prayed again and asked God. Do you want me in that room? My attendance gives the answer. My heart was pure as was my motive and intention. But the pain of those who have been hurt is real. And I would be a dishonorable man not to acknowledge that. But I will honor what I believe was the mandate on my life to be there and available to God should He choose to give me voice."